Villa Pantulan has five bedrooms located in three pavilions - The Lotus, The Temple Garden and The Rice Field. Each bedroom has a queen size bed. Villa Pantulan is located in Ubud, Bali. Ubus is located about 30 kilometres from Denpasar airport. 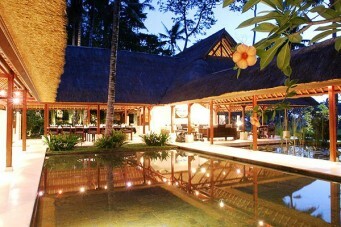 Villa Pantulan is a luxury private villa located in Ubud, Bali. It is located on beautiful green rice fields, and overlooks Mount Batukaru in the distance. Visit Pantulan to experience tranquility, privacy and enchantment. The villa is perfect for small weddings, health retreat or a corporate private getaway. Villa Pantulan consists of four pavilions, an artist’s studio, and a massage bale. There are five bedrooms which are located in three of the pavilions – all have queen size beds and house top quality furnishings and luxury amenities. The buildings all have traditional alang alang roofs with wood and terrazzo floors. The villa has many water features around the property including a swimming pool, lily pond, and a small bamboo forest waterfall. Hiking, Bicycling, Classical Dancing, Yoga, Sports: Badminton, Volleyball, Theater and plays, visits to temples, Artisan galleries, Fine dining, Elephant Rides, White Water Rafting, Kayaking, Fishing, Cave Exploration.